You’re invited to the official groundbreaking ceremony for the new Tuscany Fire Station #42, scheduled to open in late 2017. 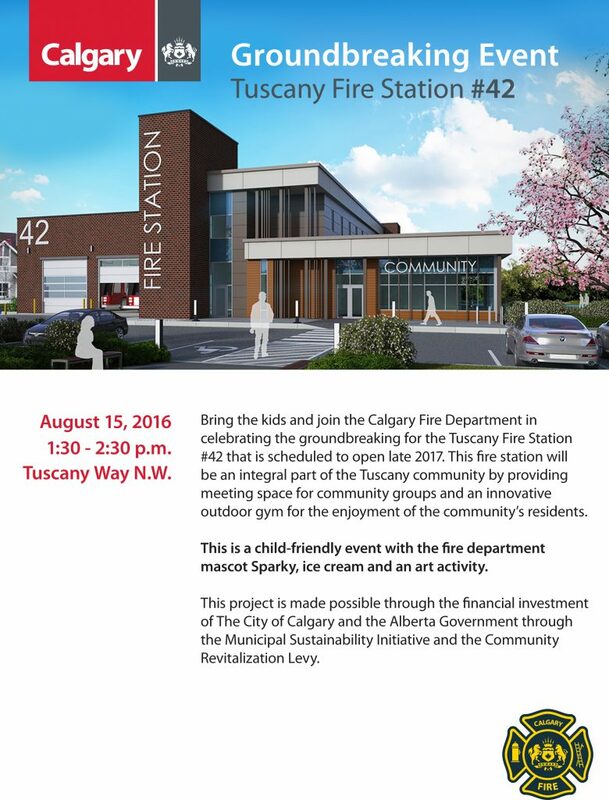 Bring the kids and join the Calgary Fire Department in celebrating the groundbreaking for the Tuscany Fire Station #42 that is scheduled to open late 2017. This fire station will be an integral part of the Tuscany community by proving meeting space for community groups and an innovative outdoor gym for the enjoyment of the community’s residents. This is a child-friendly event with the fire department mascot Sparky, ice cream and an art activity. This project is made possible through the financial investment of The City of Calgary and the Alberta Government through the Municipal Sustainability Initiative and the Community Revitalization Levy.